The Jobsite WiFi web portal is a valuable tool for you to manage the performance of a DEWALT Jobsite WiFi system, either on site or in an offsite office. The quick-view dashboard, optimized for desktop and mobile devices, allows users to easily view and manage the status and health of each network. If a problem arises in the field, the dashboard will pinpoint which access point is struggling to easily diagnose the problem. DEWALT’s SSO integration with Procore will allow authorized users of both systems to securely access the DEWALT Jobsite WiFi system via their Procore login credentials. This integration provides convenience and simplicity to users juggling multiple systems with different credentials. The free integration will start beta testing in August with qualifying Procore customers. To apply to be a beta user, please contact jobsitewifi@DEWALT.com. 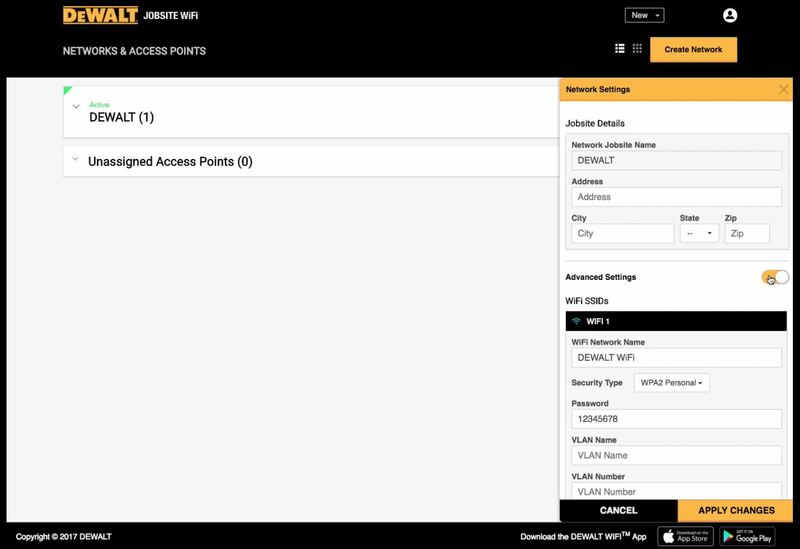 In addition to using the Jobsite WiFi mobile app onsite to configure access points, users can now simply plug a single access point into an Ethernet cable, select it within the DEWALT WiFi website, and configure it with a single click. A user can even plug in multiple access points to an Ethernet cable and update all of them with one click, which offers immense potential to save time. This configuration model is the first in a series of bulk actions the DEWALT team is testing to improve efficiencies. Do you have questions about these enhancements or want to speak with someone about connecting your jobsite with DEWALT Jobsite WiFi system? Click here to fill out the form and someone will be in touch soon. *DEWALT is not an Internet Service Provider (ISP).